The Job Forum offers links and resources to assist our participants and all those seeking employment in the San Francisco Bay Area. The Job Forum of the San Francisco Chamber of Commerce functions as a gateway or doorway to other helpful job search and career resources. We may suggest other helpful job search organizations to you and tell you the advantages of what they offer. We may inform you of other associations or clubs or professional organizations in your target industry. We may refer you to specific job fairs, web sites, libraries, publications, and books that can be helpful. The Bay Area Advertising Relief Committee provides emergency financial assistance, mentoring, networking and other resources for members of the San Francisco Bay Area advertising, marketing and PR industry. Bay Area Bioscience Association has job listings and a Career Center in bioscience and biotechnology and is open to the public free of charge. Also has a bioscience library, which includes a listing of bioscience companies. Online resources for jobs in bioscience avail. Bay Area Career Center (BACC) offers credentialed career counselors and coaches, career-relevant workshops, job support groups, and networking opportunities (open by appointment only). Monday thru Saturday 9-5pm. 629 members: The Bay Area Google Analytics Meetup focuses on Google Analytics – a free and premium web analytics platform by Google. The goal of the group is to focus on the technical as well as the business use of Google Analytics from the people new to it to the professionals. This group is for anyone passionate and interested in Google Analytics no matter what their background or level of knowledge is. 925 members: Meet others interested in developing apps on Google App Engine. This meetup has a strong programming focus, so talks showing working code and workarounds are actively encouraged. Each meetup will have a reasonable amount of time for informal lightning talks to show members’ work. Bay Area Volunteer Information Center This is a nonprofit, volunteer list which can be useful as a list of non-profit groups locally. California State Employment Development Department (EDD Career Link) provides counseling, workshops, a resource library, job club, job placement, job listings, and computerized job match service for professional people. Veterans receive priority service. No fee-open to the public. Mon-Fri 8:30-4:30, TH 8:30-7:30. Community Youth Center assists Asian American and low-income youth with referrals to CYC educational and employment focused programs. Chinese for Affirmative Action serves Asian Americans, other minorities, and low-income people. About 100 listings for clerical, white-collar, and construction jobs are updated daily. Also provides counseling, job referral, and job search assistance and helps place women and minorities in non-traditional employment. Membership is $40 (sliding scale available). English, Mandarin, and Cantonese spoken. Mon- Fri 8:30am-5:30pm. Jewish Vocational and Career Counseling Services, a non-sectarian agency, lists jobs in non-profit organizations, government, civil service, universities, private companies, and individual private employers. Career and employment counseling services are available for a fee. The approximate 1000 listings available at any time are updated daily. $1.00 charge for access to job listing binders and no membership fee. Assists with professional career development and advocacy. Also offers special programs for rehabilitation and Soviet emigre workers. Mon- Friday 9am-4:45. Media Alliance offers a job file and binders for jobs in radio, TV, public relations, writing for magazines, and newspapers for members only. Includes internships and temporary or project jobs. Membership is $60 for new members for 12 months. Office Hours: By Appointment. National Association of Women Business Owners, based in Washington DC, is a dues based national organization representing interests of all women entrepreneurs in all types of businesses. SF Chapter: (President) Barbara Mark. The SFCP is a not for profit organization with more than 160 practicing analysts and more than 45 candidates (psychoanalysts in training). The Center provides an extensive training program in psychoanalysis. San Francisco Commission on the Status of Women offers a free Job Library, which has several hundred assorted jobs from numerous agencies listed in binders. Mon-Fri 9am-4pm. San Francisco Department of Human Resources provides a posting of civil service jobs available in the City and County of San Francisco that is updated every Friday. The 24-hour job hotline message is updated every Thursday afternoon. Mon-Fri 8am-5pm. San Francisco Public Library Jobs & Career Information Center offers an online resource center (http://libgateway.com/site/sfpl/career/Home)– a one-stop portal to explore; job search video tutorials, databases, career counseling, resumes and more. Free to the public. 89 members: Are you a Social Media Enthusiast or Newbie? Ready to learn how Social Media can help your business? Interested in sharing best practices? Learn how to generate leads and grow traffic with Social Media. If you use the internet to reach your customers this group is for you! Non-profit association to help small businesses get off the ground, grow and achieve their goals through education and mentorship. A private non-profit agency to assist entrepreneurs to start, grow, and expand their manufacturing business in SF. Swords to Plowshares offers employment services for veterans. Must show proof of SF residence and veteran status. Has listings for Federal and social service jobs as well as local business listings, updated weekly. Specializes in one-on-one counseling and placement in the private sector. Women’s Building has 100 assorted job listings in binders that are updated weekly. Mon-Fri 9am-7pm, Sat 9am-12pm. Worklink a non-profit providing employment and educational services for individuals with disabilities. Alameda County Business Collection in the Fremont Main Library has hundreds of listings of municipal, county, and public jobs in binders that are updated weekly. Open Mon & Tues 1 pm-9pm, Wed 11 am9pm, Thurs & Fri 11am-6pm, Sat 10am-5pm, Sun 1pm-5pm. Center for Independent Living offers assistance to job seekers with disabilities. Consumers are taught job search techniques and receive job referral and follow-up counseling. Job club available for consumers. Mon-Fri 9am-12pm & 1pm-5pm. Spanish Speaking Citizens Foundation offers job counseling and training, employer assistance, job referrals, and job announcement listings. Spanish and English spoken. Novato Human Needs Center is a free community service organization for Novato and North Marin residents only, which provides an employment & job matching program. Hundreds of job listings updated daily. Job counseling is available. Mon-Fri 9am-5pm. YWCA-SF & Marin County Center offers a Career Mentorship Project, Youth Employment Program, Mature Worker Program, Career Transitions Program, Legal Information Clinic, and low-cost career counseling. Assorted job listings regularly updated. Mon-Fri 9am-5:30pm. NOVA is a nonprofit, federally funded employment and training agency that provides customer-focused workforce development services. We work closely with local businesses, educators, and job seekers to ensure that our programs provide opportunities that build the knowledge, skills, and attitudes necessary to address the workforce needs of Silicon Valley. Project Hired assists those with disabilities to gain competitive employment. 949 members: This is a group for anyone interested in building or learning about chatbots, artificial intelligence, natural language processing, Facebook Messenger, Slack, Telegram, Discord, Kik, SMS, etc. Let’s share our knowledge with each other and collaborate. 80 members: Whether you’re trying to figure out how social media can benefit you and your business, or you’re a veteran social media expert, this mastermind group is for you. Whether you’re an entrepreneur, small business owner, or executive, you understand the power of networking. This mastermind group is about implementing ideas that work. You’ll share, inspire, encourage, learn and grow from each other’s knowledge. You’ll engage in conversation, help increase your platform for your personal or business brand, and give you comments and feedback. The meetup starts with a quick introduction of ourselves and then dive right into questions and content for the day. They’ll provide a safe place for your questions. And if you’re new to social media, they’ll cut through the fog and give you fresh perspectives. For all you tweeps, use #baysocial to share. We want to know more about you what you expect from this group. Have a question? Contact alison@cornerstonecreative.net. AFWA is “Education, Inspiration, Networking and Fun” and is a member-driven organization. They increase your technical knowledge, skills and abilities, help in keeping members abreast in their field of expertise and provide career management, transition guidance and assistance. What is its purpose or mission? The Accounting & Financial Women’s Alliance is a professional organization dedicated to enabling women in all accounting and related fields to achieve their full personal, professional and economic potential as well as contributing to the future development of their profession. • Regular Member ($140) – Holds a CPA certificate or equivalent or has two/more years of experience in accounting or finance or holds a bachelor’s degree in accounting or a related field. • Affiliate Member ($140) – Not actively engaged in the accounting or finance industry or has a substantial interest in accounting or finance. • Associate Member ($45) – Regularly enrolled student or has fewer than 2 years of experience in accounting or finance. • Retired Members ($33) – Members must meet specified qualifications to attain this status. • Emeritus Members – An exclusive membership status for our longest term members. Members must apply or be nominated for this status. Who belongs (numbers and profile and job titles)? The organization has grown to include more than 80 chapters throughout the United States with approximately 3,500 members – they are in the field of accounting and finance. Members are from regional and local CPA firms, financial officers, controllers, academicians, financial analysts and data processing consultants, recent college graduates and women returning to the work force. What are examples of programs? Does it have networking events? None coming up. Did a few in the past. Does it have a job openings list or job board? Can non-members attend events or participate? Why in essence should one belong? An association that provides leadership for legislative, advocacy and promotional efforts on behalf of LPCC in California. Their mission is to build and support the recognition and effective utilization of LPCC in California as distinct and valuable providers within the clinical mental health profession. Organized networking opportunity for mental health providers and training to help mental health providers to stay current with their skill. Founded in 2007, calls itself the Return-to-Work experts and focuses on professionals returning to work after a hiatus, usually for parenting. They are headquartered in New York, but offer a variety of online resources for people throughout the country, including an excellent blog which recently has covered topics such as rebuilding confidence, resume writing, and job search tactics, along with a salute to fathers who have taken career breaks to care for children. iReLaunch offers a job board, resume posting, and an online Return to Work Bootcamp (coming up in October); sponsors an annual Return to Work conference (in New York City); and trains recruiters, employers, and academic institutions on how to assess relaunchers. 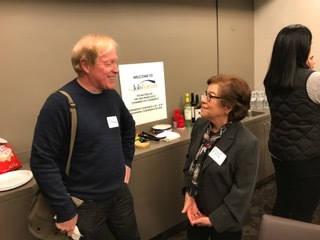 Founder Carol Fishman Cohen is a prolific speaker and writer who particularly advocates internships as a tool for relaunchers and employers. Anyone returning to work after time off for family or personal reasons is likely to profit from at least reading what iReLaunch has to offer, including learning how to talk about one’s time off and how to formulate and present one’s present goals. The Northern California HR Association (NCHRA), one of the nation’s largest HR associations, has been advancing organizations through human resources since 1960. Delivering over 200 programs annually, the association is dedicated to connecting human resources professionals with practice resources, leading California-specific training, legal and legislative developments, quality service providers, and each other — forming career-long networks and partnerships. To educate, connect and lead the HR profession to achieve individual and organizational excellence. NCHRA serves a community of more than 20,000 throughout its twelve regions in Northern California, whose focus is on the HR sector. It offers and extensive resource list for members and non-members, from legal and compliance training to job description builders to an HR hotline. As well as numerous professional and networking events, certification and re-certification courses and a job board. It’s the leading HR association in Northern California and offers all the resources a seasoned HR professional or someone just starting out should need to succeed in the field. There are events to broaden your network and hone your skills. The NCHRA is nationally recognized for providing the highest quality continuing education and is one of the largest HR associations in the country and showcases more educational events a year than any other association in the nation and is 30-60% cheaper than comparable offerings. The people who make up NorCalBMA are marketing professionals who do the big jobs, who define business goals, direct business strategy. They are idea people, visionaries and leaders, strategists and implementers. They serve as VPs, managers, entrepreneurs, and professionals who stand out in any professional crowd. It offers monthly events and access to job board and sponsorship opportunities to get in front of elite B-to-B marketers. Networking events and mixers, monthly events hosted by industry leaders, professional development & learning seminars, NorCalBMA roundtables, members only conferences that bring together top client-side digital marketing professionals and key industry experts to discuss B2B marketing topics. Yes, there are over 40,000 B2B companies in the San Francisco Bay Area and representatives from a number of these companies routinely attend their events. Face to face interaction with these marketing professionals is invaluable. Often, they are looking to make connections just like you. The San Francisco Chapter of the California Association of Marriage and Family Therapists (SFCAMFT) is a local chapter to provide you with opportunity to participate in advanced clinical training, practice building, professional development, networking, gaining referrals and the promotion of the MFT profession. Offers employment services including resume review, individual consultation on job search strategy, job search workshops on a variety of subjects, networking groups, and periodic career fairs as well as employer outreach and diversity training. Their focus is of course on LGBT folks who are job searching, including people who are new to the Bay Area. They created the first Transgender Employment Program and generally seek to serve as a clearinghouse for services and events of special interest to LGBT people as well as a link to LGBT employers such as members of the Golden Gate Business Association. The San Francisco Chapter of the American Marketing Association fosters and promotes professional learning and career advancement opportunities for all members. The chapter hosts a wealth of monthly programs, events, workshops, and discussions that introduce the latest industry trends and developments, along with valuable networking events that bring together the best marketing minds in the region. Their mission is to be a community and provide a forum dedicated to connecting Bay Area marketers with new ideas, forward-thinking people, and professional opportunities to help us all grow in our careers and further our personal development. 30,000 (nation wide) members who work, teach and study in the field of marketing. By joining the SFAMA you have access to not only the resources in SF but access to all the resources the AMA offers, which is invaluable since it’s one of the largest marketing associations in the world. By becoming a member it can move your career forward by connecting you with other marketing professionals, high quality training, the latest tools and tactics, exposure to leading edge thinking and incredible networking opportunities. 43 Resume Tips That Will Help You Get Hired – And #43 is the Most Important! If you read only one piece of advice on networking, read this—great perspective on the best way to approach and grow your network. Every successful next step starts with reaching out to just one powerful person the right way. Here’s how to do it.